Tracing your family history has become easier with digitized records, including immigration documents, newspaper articles, passenger lists, and more. But have clues to your ancestry been hiding under your socks this whole time? As a premise, it seems far-fetched – but some believe the outline of your feet can help you trace your family heritage. What can the shape of your foot or the length of your toes say about your ancestry? Is there a fundamental truth in phalanges? Let’s have a look. Foot and toe ancestry suggest that by looking at the shape of your feet, you can make an educated guess about the origins of your ancestors. This theory says there are essentially five major foot shapes: Egyptian, Roman, Greek, Germanic, and Celtic feet. Each group has a particular outline and arrangement of toe lengths, which hint at the population origin. According to feet ancestry, Celtic feet have the most complex shape, with a large but short first toe, an exceptionally long second toe, and the remaining toes tapering to a small pinky. Celtic feet appear to be something of a combination of the Germanic and the Greek toe shapes, sharing the larger first toe of the German with the variety of lengths (especially in the case of the second toe) of the Greek. Compare your toes to Celtic feet. Maybe you’ve got the luck of the Irish in you. Or maybe on closer inspection you’ve got a long first toe with all the others tapering down from there? In that case, you may have the so-called Egyptian foot. But, can these archetypal shapes really tell us anything about our ancestry? What does science have to say about this idea? 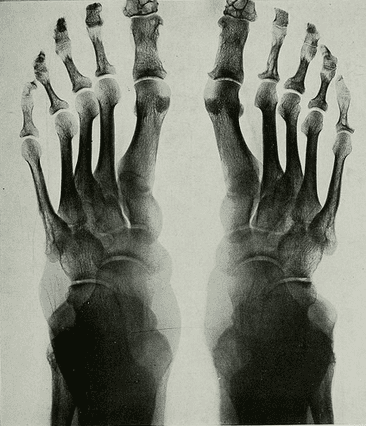 Photo: x-ray of a human foot. Credit: University of Toronto; Internet Archive. It’s important to note that there is no scientific evidence that our feet conform to archetypal shapes, or that foot shape ancestry is an accurate way to trace your heritage. Data collected on multiple populations show a trend of their second toe being the longest (as seen with the Greek foot). For example, the Ainu people, an indigenous community in Japan, exhibit the second toe as the longest in 90% of individuals (an extreme example). However, it would be bizarre to think that the Ainu originated in Greece. If we consider the claims of toe ancestry as a potential way to categorize an actual genetic group, then we need to look critically at the words used to describe the foot shapes. Why Egyptian, Roman, Greek, Germanic, and Celtic feet? Illustration: toes. Credit: Library of Congress; Internet Archive. Speaking primarily of the Egyptian, Greek, and Roman feet ancestry shapes, these are the idealized foot form in their respective culture’s art. For example, the Greek foot is one you can see on the statues that adorn the Acropolis (also the Statue of Liberty as it happens). While this may indicate that a majority of Greeks of that period had a foot shape like that one, it is much more likely that that was simply the standard of beauty at the time. Many modern ideas surrounding the concepts of “Germanness” and “Egyptianness” are just that: modern. The idea of an “ethnic German” was one essentially constructed in the 19th century when that area of Europe — traditionally divided into multiple different regions such as Prussia, Saxony, and Bavaria – was unified as the State of Germany. The “Germans” as the Romans knew them were a diverse mix of people and cultures. Romans called this group Germans because Rome saw them as barbarians and didn’t care to learn more about them. The idea of foot shape ancestry and toe shape ancestry is rooted in a similar misconception that populations were ever made up entirely of one group. Human populations have migrated, fought, mixed and mingled throughout time. The idea that there was ever a monolithic population with Celtic feet is rooted in a grossly oversimplified version of how and where humanity has lived. So, can you learn about your family origins from your foot shape? Possibly not. However, it is fun to have a look – and this idea could help inspire younger generations to learn more about their ancestors. Irish, Scot, Native American with Greek feet. What does it mean when your third toe is the longest toe? My family tend to Greek toes, but my third toe is longer than my second. If it wasn’t in the middle of winter and it’s cold in here, I would take off my shoes now and look at my toes. I’m gonna copy this article and send it to all my sisters. ha ha. All of us will be checking our toes in the next couple of days. Thanks for writing us, Anne. Hopefully you can do your foot examination in front of a wood stove, fireplace, or a heater! Irish (69%) with Greek feet. Same as my mother & grandmother. My feet outlines Egyptian yet in another test Roman yet not in my feet. So it’s never accurate. Liked your Foot article and Mayflower roll call article. This is all very interesting even though it may not be of much good to determine one’s genealogy. But it — maybe — would be of some benefit to know of the different configurations of the toes on a person’s feet. Those who manufacture shoes (foot ware) need to be a bit alert to the different foot configurations I would think. Interesting to say the least. I have also heard that the Egyptian feet are called perfect feet! Unfortunately, my “Egyptian” feet are probably the most attractive parts of my body. One should not be so negative about a good idea. Seems we need more current and historical data for a continued “look -see”. My feet have the slant of the Egyptian design. However, my toes are stubby, single jointed, ending in a wide side. My stubby little toe can create a bump out in any style or fabric and always attempts to escape the confines of a sandal. That’s describes a chubby Egyptian foot. Go figure. Egyptian Feet is what I have. According to Heritage.com I have 8.6% DNA from North Africa which includes Egypt. Adds to the anecdotal story. My toes are not stubby I do have narrow heals tho which makes shoes hard to fit. My Egyptian foot? Prone to a number of foot problems including some made by me… bunions, triple AAA… FLAT ARCH or is it fallen… LOL… Can’t judge a person by their feet… thank the gods. Well, I didn’t make the triple AAA but u get my footprint.